Many awesome motorcycles are launching this year and definitely, choosing any one of them is going to be more difficult. That’s why the year 2019 is the most exciting year for all motorcycle enthusiasts. 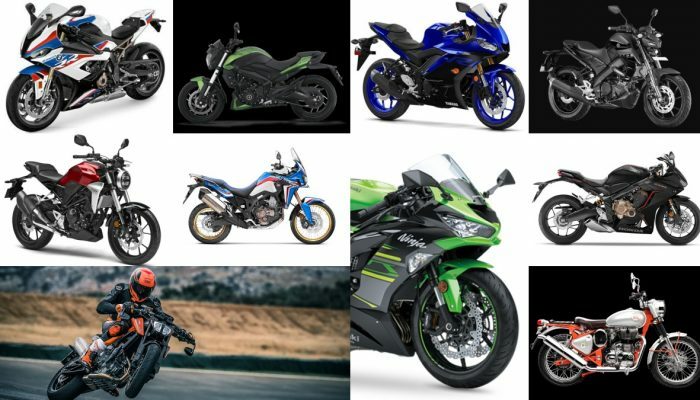 If you are one of us, then here is the list of New Bikes In India 2019 for you. We will keep updating this article whenever necessary, so stay tuned. Bajaj Auto has updated the Dominar 400 and the MY2019 model features a host of updates. When compared to the outgoing model, the 2019 Bajaj Dominar 400 comes equipped with USD forks at the front, new double barrel exhaust, under seat bungee cords, redesigned mirror stalks and a refreshed instrument cluster. The secondary display too has been revised and now showcases the gear position indicator, time and trip meter. The engine has been re-tuned and now produces 40 hp at 8,650 rpm and 35 Nm of torque at 7,000 rpm. Available in two colour options including Matte Grey and Auroral Green, the 2019 Dominar 400 is priced at INR 1.73 lakh (ex-showroom, Delhi). Royal Enfield recently introduced the Bullet Trials 350 and Bullet Trials 500 in the Indian market, with prices starting at INR 1.62 lakh and INR 2.07 lakh (all prices, ex-showroom Delhi) respectively. As the name suggests, the model is based on the standard Bullet 350 and Bullet 500 and is offered in the Scrambler format. The Bullet Trials siblings come equipped with a taller handlebar with cross brace, single-seat setup, upswept exhaust and 18-inch tyres and 19-inch tyres at the front and rear respectively, both wrapped in Ceat Tyres. The company offers dual-channel ABS as standard on both the variants. The Bullet Trials 350 and Bullet Trials 500 are powered by the same engine as their standard counterparts and hence the engine specifications remain unchanged. Launched in March 2019, the Yamaha MT-15 is the naked sibling of the popular YZF-R15 fully faired motorcycle. Powering the motorcycle is the same 155cc fuel injected engine with Variable Valve Actuation (VVA) technology that produces 19.3 hp at 10,000 rpm and 14.7 Nm of torque at 8,500 rpm. This engine is paired to a six-speed transmission. Feature-wise, the MT-15 receives single-channel ABS, Assist and Slipper (A&S) clutch, conventional telescopic forks at the front, box type-swing arm, projector headlamp and LED DRL’s. Available in two colour options including Metallic Black and Matte Dark Blue, the MT-15 is priced at INR 1.36 lakh (ex-showroom, Delhi). Available at select Honda dealerships for a price tag of INR 2.41 lakh (ex-showroom, Delhi), the Honda CB300R rivals the likes of the KTM 390 Duke and the BMW G310R in the sports naked category. The motorcycle receives retro styling although the model receives the latest features in the form of all LED lighting, fully digital instrument cluster, USD forks at the front and a pre-load adjustable monoshock unit at the rear as well as dual channel ABS. Powering the model is a 286cc, liquid cooled engine that puts out 10.4 hp at 8,000 rpm and 27.4 Nm of torque at 6,500 rpm. The model weighs 147 kgs while the fuel tank capacity is rated at 10 litres. Kawasaki launched the Ninja ZX-6R in India, with prices starting at INR 10.49 lakh (ex-showroom, Delhi). Bookings for the motorcycle had begun back in October 2018 while the model was launched in India in January 2019. The super-sport sources firepower from a 636cc, an in-line four-cylinder motor that is capable of producing 130 hp and 70 Nm of torque. Paired to a six-speed transmission, the model tips the scales at 196 kgs while the seat height stands at 830mm. The model is available exclusively with the KRT edition colour scheme in India and can be had only in the single seat format. The model features Kawasaki Traction Control (KTC), Kawasaki Quick Shifter (KQS) (upshift only), ABS, two power modes, full LED headlights and a semi-digital instrument cluster. After launching the entry-level 125 Duke in India, KTM seems to be preparing for the launch of its middleweight naked motorcycle, the 790 Duke. While there has been no official confirmation from the brand regarding the launch, a few reports suggest that the model, also known as ‘The Scalpel’, is likely to be launched in the country as early as next month. At the heart of the upcoming KTM 790 Duke will be a 799cc, parallel twin engine that will produce 105 hp of power and 87 Nm of torque. This engine will come mated to a six-speed transmission with a Quick Shifter (up and down). A few other feature highlights of the model include WP sourced 43 mm USD forks at the front and a monoshock unit at the rear, Supermoto mode, traction control, Motorcycle Stability Control (MSC) with cornering ABS and three riding modes. Honda 2 Wheelers India launched the 2019 Africa Twin in India, with prices starting at INR 13.5 lakh (ex-showroom, Delhi). One can differentiate between the 2018 Africa Twin and the 2019 model as the latter receives a new Glint Wave Blue Metallic paintjob, gold accents on the handlebar and gold coloured spoked wheels. Save for the changes, both the models remain identical. Propelling the model is the same 998cc, liquid cooled, parallel twin engine that produces 89 hp at 7,500 rpm and 93 Nm of torque at 6,000 rpm. This engine is paired exclusively with a six-speed DCT transmission while the international spec model can also be had with a six-speed manual unit. Features wise, the model receives Throttle-By-Wire (TBW), seven-level Honda Selectable Torque Control (HSTC) system (traction control in layman terms) and four riding modes. Yamaha showcased the new second generation R3 at the Bangkok International Motor Show held earlier this year in Thailand. The 2019 model retains the mechanicals although there are a few ergonomic updates to the bike which come in the form of lower clip-on handlebars, revised steering geometry and further rear seat foot-pegs. The upswept tail section also hints at a redesigned sub-frame while the front forks are now USD units. Also on offer will be a fully digital instrument cluster. Engine specifications will remain unchanged and hence the 321cc twin cylinder motor will continue to produce 42 PS of power and 29.6 Nm of torque. Dual channel ABS is available as a standard feature. Honda 2 Wheelers India has commenced bookings of the new 2019 CBR650R against an amount of INR 15,000 at Honda Wing World dealerships ahead of its launch that is scheduled to take place in the coming months. The model, which replaces the now discontinued CBR650F, will be brought to India via the CKD route. Honda had previously revealed that the 2019 CBR650R will be priced under INR 8 lakh (ex-showroom). Feature-wise, the model comes equipped with Showa sourced 43 mm USD forks at the front and a monoshock unit at the rear, dual channel ABS, full LED headlights inspired from the Fireblade and an all-new full LCD instrument console. Powering the model will be a 649cc, in-line four-cylinder motor that produces 95 hp at 12,000 rpm and 64 Nm of torque at 8,500 rpm. Honda will also offer their own version of traction control, known as Honda Selectable Torque Control System (HSTC). Colour options for the model include Grand Prix Red and Matte Gunpowder Black Metallic. About 10 years after the debut of the S1000RR, BMW Motorrad unveiled the second generation S1000RR at the EICMA Motor Show in Milan last year. Recently, BMW Motorrad India shared a teaser of the S1000RR, hinting that the launch is not far away. The model has been completely revamped ground up and features a redesigned chassis with lighter components including a WSBK inspired swingarm. Also on offer is a new suspension for improved handling and traction. Now, the S1000RR can also be had with an electronic suspension, just so you know. The new lighter parts have resulted in savings of 11 kgs over the outgoing model. Firepower comes from an all-new 999cc, an in-line four-cylinder motor that produces 207 hp at 13,500 rpm and 113 Nm of torque at 11,000 rpm. Features on the model include a quick-shifter (up and down), four riding modes (Rain, Road, Dynamic and Race), Dynamic Traction Control (DTC), cornering ABS and a 6.5 inch TFT display.